The Summit had Mr Manish Sisodia, Deputy Chief Minister, Government of Delhi, as the Chief Guest. The Summit was attended by more than 250 senior industry and educators of notable Higher Education Institutes of Delhi. A report on ‘Higher Education in Delhi’ was also released on the occasion. A ﬁrst of its kind, the report covers in-depth the eco-system of higher education in Delhi state, which will hopefully lay the groundwork for more research and work by academics and other organizations. 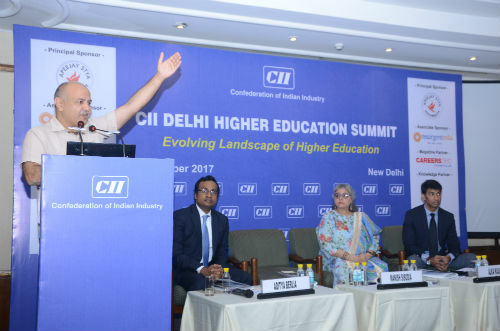 Mr Manish Sisodia, Deputy Chief Minister, Government of Delhi, during his address on the occasion congratulated CII for organizing the Summit and its commendable efforts in Delhi in various sectors. He also appreciated CII’s Report on Higher Education. He said the report was the need of the hour and would act as a ready reckoner for anyone needing some information about Delhi’s Higher Education Ecosystem. He highlighted that the quality of education had to be improved and should be more research-oriented. He said Higher Education Curriculum should be line with what a student wants and what was the industry needed. Just as infrastructure was planned five or ten years in advance, education curriculum should also be decided in advance. He said Delhi needed Technology hubs and incubation hubs in the state. He also announced that if any research and development institute was able to raise funds from a private source, the Delhi Government will match that amount and fund that R&D project. Dr Alka Kaul, Past Chairperson, CII Delhi State Council, and; Director, Horizon Industrial Products Ltd. said it was important to leverage education as a tool to foster inclusive growth and provide equality of opportunity to all segments of the society. The primary objective of education and skills development must be to integrate the beneficiary into the work process in an optimally productive and personally fulfilling manner. Dr Kaul also highlighted the disconnect which she said was growing between the needs of the industry and the skills that were being imparted through education which needs immediate attention and focus on soft Skill Development Programme for our students who want to go for job or higher studies should be imparted. Mr Aditya Berlia Convenor, CII Delhi Panel on Education, and; Member of Management Board, Apeejay Stya and Svran Group, and; Co-Founder & Pro-Chancellor, Apeejay Stya University, while setting the theme said New Delhi, as the capital of India, had always been subsumed into the greater all India conversation on higher education. 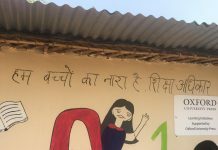 Being a landlocked area with extremely high costs for real estate, it must ﬁnd unique and innovative solutions that allow higher education and skill development to thrive. He said Delhi should take the lead in the country to showcase visible impact of its knowledge ecosystem on the society and business by creating vehicles those translate knowledge to economic development and growth. Prof Simrit Kaur, Principal, Shri Ram College of Commerce, Dr Poonam Verma, Principal, Shaheed Sukhdev College of Business Studies, Prof M P S Bhatia, Dean, Netaji Subhas Institute of Technology, Prof S K Garg, Pro-Vice Chancellor, Delhi Technical University and Ms Atishi Marlena, Adviser to Deputy Chief Minister on Education, Government of NCT of Delhi, also addressed the Summit.